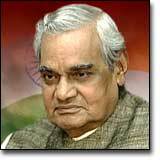 Atal Bihari Vajpayee : Orator par excellence, veteran parliamentarian, poet, visionary, a man of peace and the prime minister of India. 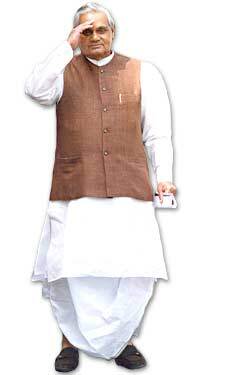 Vajpayeeji will be completing six years in office as prime minister of India in March 2004. What I find admirable about him is that he is one of those politicians who has grown in stature each day that he has spent in public life. He is a man who can rise above party interests when required. He has a big vision, he is large-hearted. He broadly thinks of the system. He thinks of the institutions. He has great commitment to the parliamentary process. He has great commitment to values. Though Vajpayee's pan-Indian appeal was never in doubt, this has strengthened his position -- both in his party as well as in government. There simply isn't an alternative for this bachelor boy of Indian politics. A pragmatic and pro-active approach in foreign policy, buoyant markets and Forex reserves which have touched the $100 billion mark have all contributed to the feel-good factor, as Vajpayee basks in the glory of the nation. Vajpayee also intends to go that extra mile when it comes to relations with Pakistan. The result is already seen in the form of confidence building measures of both the nuclear neighbours who had, barely some months back, amassed a million troops on the border. Though it is not sure if the PM will spring a surprise in the SAARC meet in Islamabad, the momentum for talks between the estranged neighbours has already been set by Vajpayee. That is a giant leap in the turbulent history of Indo-Pak ties - a leap made possible by Vajpayee. And if India and Pakistan are to set aside their differences and move forward in the path of peace, Vajpayee will the one BIG reason for it. He is one prime minister who spends a lot of time in Parliament. In every session there are at least one or two occasions when he makes personal interventions. During the session he is always available in his room in Parliament House for anything that may emerge. He has great commitment to parliamentary democracy. He is also a man who makes personal accommodations. This is why he has been able to lead a 24 party alliance. None of the alliance partners is in a position to speak against him. Running such a large coalition is challenging, but he has been able to do it successfully. Orator par excellence, veteran parliamentarian, poet, visionary, a man of peace and the prime minister of India, Vajpayee has donned many hats. All with his customary aplomb and trademark wit. Vijay Goel, minister of state in the prime minister's office, has known Vajpayee for about 30 years. He recently asked the prime minister: "Who has inspired you most?" "My father Krishan Bihari Vajpayee; (the RSS' second sarsanghchalak) Guru Golwalkar; (the late Jana Sangh president) Pandit Deen Dayal Upadhyaya; and (RSS leader) Bhaurao Deoras," the premier replied. When Goel asked the prime minister what the most bitter moment in his life was, Vajpayee had an unusual response: "When I was slapped by a teacher for being naughty (Shararat karne per mar padi)" when he was in the 5th standard. When Goel asked what he attributed to his success to -- Vajpayee, a teacher's son, made it to the highest office in the land -- the prime minister's response was just one word: "Bhagya (destiny)." The Bharatiya Janata Party and its adherents may mock Jawaharlal Nehru and Nehruvism at every opportunity, but Atal Bihari Vajpayee has never hidden his admiration for the man who first highlighted his parliamentary skills way back in the 1950s. When Goel asked who his favourite leader was, Vajpayee named India's first prime minister. He also admired Indira Gandhi, comparing her to Durga in Parliament in a famous speech to commemorate India's victory in the December 1971 war. Even though he was widely considered one of India's finest MPs, no one knew how good a minister he would make until Prime Minister Morarji Desai appointed him external affairs minister in his Janata Party Cabinet in 1977. Vajpayee remembers that competent two-year tenure often. He cites his first speech at the United Nations General Assembly -- delivered in shudh Hindi -- as the most unforgettable moment in his life. The prime minister is not known to be particularly religious, but he told Goel that he often reads the Mahabharat and Ramayan. He also revealed that he reads Kalidasa's Meghdoot and Shakespeare's plays. He added that he read the Vedas when he was a prisoner at New Delhi's All India Institute of Medical Sciences during the Emergency. Put him in front of a crowd anywhere in the world even now and watch the years melt away in an instant. Generations of politicians all over India have tried to model their oratorical skills on Vajpayee's legendary style. But truly, there can only be one Atal Bihari Vajpayee. Once at an election rally, when he was presented an ornate garland, he responded, "Main har (garland/also defeat) nahin, jeet lene aaya hoon." L K Advani once told that Vajpayee remonstrated with him in 1995 after he told the BJP convention in Mumbai that Vajpayee would be the party's candidate for prime minister in the 1996 general election. "Aap ne mujhse poocha bhi nahin (You didn't even ask me)!" Vajpayee exclaimed. "Kya aap maante agar hum ne aap se poocha hota (Would you have agreed if I had asked you)?" Advani replied. Though rumours swirl about their crumbling relationship, the Advani-Vajpayee combo has endured, perhaps only natural in a relationship that goes back half a century. As Vajpayee told Goel he never forgets the day his party was handed a humiliating defeat in an election, after which Advani and he went to see a Hindi movie! While returning from the campaign trail in Gujarat recently, Goel asked the prime minister what he missed most in life. Vajpayee wrote his reply on a piece of paper: Fakkadpan (A life without responsibility). Why did you stay a bachelor, asked Goel. "I didn't find the time to get married," Vajpayee replied. Though he almost always sports a dhoti-kurta or a Nehru jacket, Vajpayee confessed to Goel he likes to wear Western outfits. Alas! The need to be politically correct prevents such sartorial adventures. This image is a rare exception. What was the most thrilling moment in your life, Goel asked him. "When President Shankar Dayal Sharma called me to form the government despite our party being in a minority," Vajpayee recalled that summer day in 1996. His most agonizing moment? "When we lost by one vote in the Lok Sabha (April 1999)." Most people know the prime minister adores dogs, perhaps more than he loves his Khichdi, Puri Kachori, Dahi Pakora, Paratha, Kheer, Malpua, Mangouri and Chinese cuisine. "Gussa to roz hi aata hai (I get angry every day!)!" the prime minister revealed, adding that what angers him most is when success is elusive. The prime minister told Goel he likes Manali and Almora in India and, intriguingly, Vancouver in Canada. He loves winter, he says, and at his old bungalow on Safdarjung Road, he would lie down in the sun during the cold winter months. What have I lost or gained on earth? As I appraise the past, sift though memories. Though it longs to last a hundred autumns. I open the door on my own. let us test the wings of life. Let us speak to our own selves.